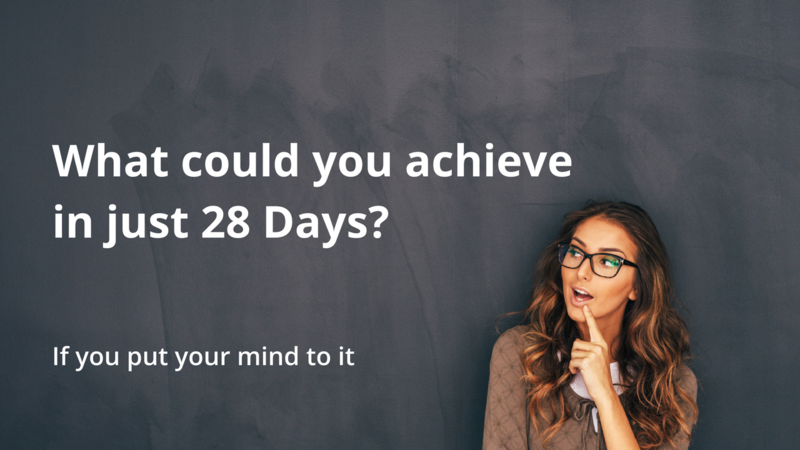 What could you achieve in 28 days if you set your mind to it and had ongoing support and encouragement along the way? Now's your chance to finally tackle an area of your life where you want to make changes but have been putting them off for some time. Join me for this 28-Day Challenge and turn it into 28 Days of Achievement. Start by taking the short free tutorial Break that Habit. Register here and each day during the challenge you'll receive either a short tutorial, a motivational quote or a tip to keep you going until the end. You'll also have the option to join a private Facebook group where you can interact directly with me and others taking the challenge. This is proven to be an effective way of staying on track. You get to choose the topic and the challenge. Here's a list of ideas, if you don't already have something you'd like to work on. It's completely FREE. The only cost to you is your commitment, time and discipline to make it work and complete the challenge. This in itself is the challenge within the challenge! Imagine the feeling when you achieve something truly important to you! This is a short tutorial on dealing with unwanted habits. Do the exercises and apply them to at least one habit in your life that you'd rather not have and then notice your results.